Around this time each year, I start to get excited for spring. I know better: one 60-degree day does not a season make. And I love winter – I do! 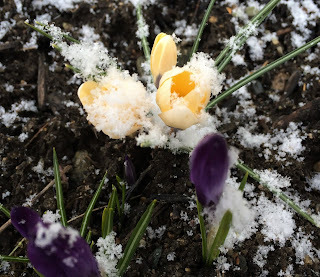 But it’s hard to not look forward to green grass and pretty crocus blooms when the sun is out – and the driveway is a mess of sinking mud and melting ice. At each seasonal junction, I am thankful to live in a place with four seasons. (I know some people count mud season separately, but there is no slush solstice or mud season equinox.) How fleeting would spring’s fragile blooms seem without the knowledge that sturdier summer blossoms were on the horizon? How could we love the heat of summer so without the promise of crisp fall days to come? How bare would the late autumn trees seem without being able to look forward to winter’s snow-laced mantle? Now, at this pivotal time, I am cherishing each day on the snow I can get, hoping (futilely, probably) for another few ski-through-the-woods outings with the dog, maybe even one more powder day. But I am also relishing the sun on my face, the warm afternoons when I can open the windows and let fresh air filter in, the mornings when I am comfortable leaving the house in a lightweight vest instead of my long down coat. It’s around now that I start talking with the kids and with friends about warm-weather adventures: hiking and camping, running the backroads, paddling kayaks along the water. Often, these conversations happen as we drive toward the ski area or ride the chairlift. That seems less like irony to me than faith in the world continuing to spin from one season to the next. You see, I’m not wishing days away, lamenting the cold and snow as I long for the next season. After as many trips around the sun as I’ve had – all of them in places with distinct, if sometimes slow-to-arrive seasons – I’ve learned (usually, at least) to accept whatever the weather presents and try to dress accordingly. New England weather is, after all, notoriously mercurial – and getting more so, it seems, all the time. So while the calendar says the new season arrived this week, I know that winter, or at least wintery weather, can – and likely will – return before spring really settles in. I’ve seen snowstorms in May, including one Memorial Day weekend when the kids were able to make a snowman in the front yard – then came inside to eat ice cream cones in front of the fire. And that’s OK. Part of living here is rolling with that wacky weather. I’m more likely to be upset about a 50-degree day in January than I will be by a 40-degree morning in June. I know that for the next several weeks, the ski boots will share space with the soccer cleats and the flipflops. The laundry pile will comprise shorts and t-shirts along with long underwear and wool socks. By the time I feel comfortable packing away the down coat, I often just leave it hanging in the closet by the front door, knowing I’ll need it again soon enough. 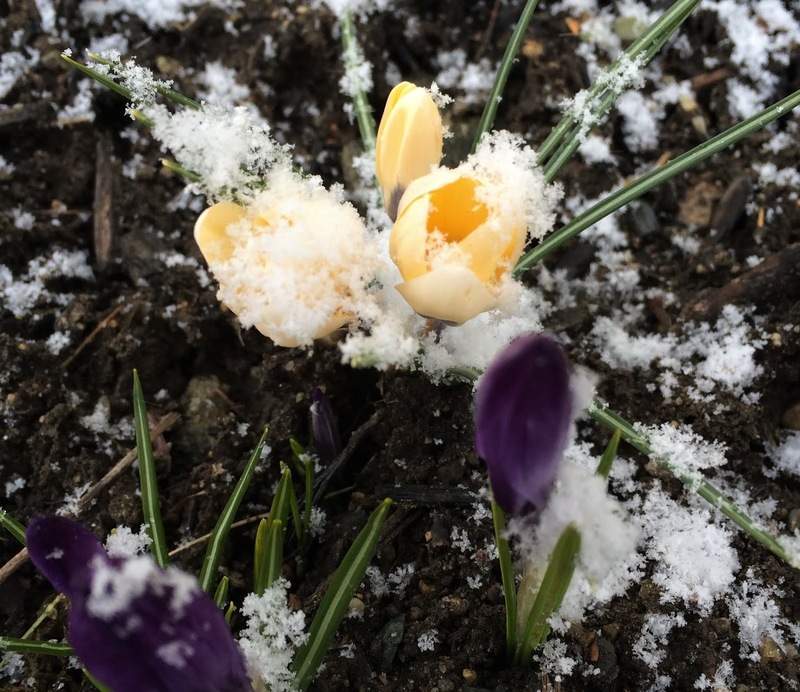 On these warm new-spring days, when the sun seems to sink more slowly than it has for ages, we – all of us: kids, dogs, grownups – stay outside a bit longer, lingering even in the sinking mud and slushy snowmelt, peeking into the flower bed to see if the crocus leaves are popping up yet. We are not so much eager to push winter behind as we are ready to welcome what comes next – knowing it will all cycle around again. And thankful for it. Original content by Meghan McCarthy McPhaul, posted to her blog, Writings From a Full Life. This essay also appears as Meghan's Close to Home column in the March 22, 2019 issue of the Littleton Record.